The profile width is 2 3/8”, making this picture frame substantial and capable of being multi-functional in its use. You could use this frame to match decor in a rustic setting, or to frame a mirror for a living room. 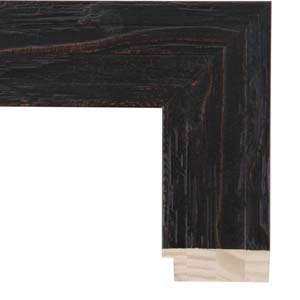 This dark picture frame would also pair nicely with nature art, perhaps pulling out the textures in a painting of a black bear, or a deer hiding in a Pacific Northwest forest. 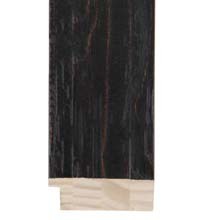 Additionally, the deep and rich color tonality of this frame is symbolic of the acidic flavor profiles of coffee, and would be an excellent choice for menu boards or custom sandwich boards at a bustling cafe or trendy coffee shop, especially one with an outdoorsy mountain motif full of unique woods and jackelope antlers. Finally, consider three additional picture frame mouldings within the family of this profile finish, with V838 in a 1 ½” width, V832 in a 3” width, and V829 in a gorgeous and commanding 4” width.